Ersatztermin für die Annihilator Tour 2018! Die alten Karten behalten Ihre Gültigkeit oder können an den jeweiligen Vorverkaufsstellen zurückgegeben werden. Since 1989, Canada’s ANNIHILATOR have not stopped putting out records and touring the world. Despite the ever-changing climate of the Metal World (and releasing a series of “different” Metal records with variouslineups along the way), Jeff Waters and company have consistently delivered strong albums since the band’s debut “Alice In Hell”. Then there was 1990’s best-selling “Never, Neverland”, 1995’s “King of The Kill”, “Schizo Deluxe” in 2005 and many other critically-acclaimed releases up until 2015’s “SuicideSociety.” The ‘under-the-radar’ influence of this band, and writer/guitarist/vocalist Jeff Waters, has been felt throughout the entire realm of the metal world by a ton of well-known musicians and bands; that influence even stretching into the hard rock and instrumentalist genre. 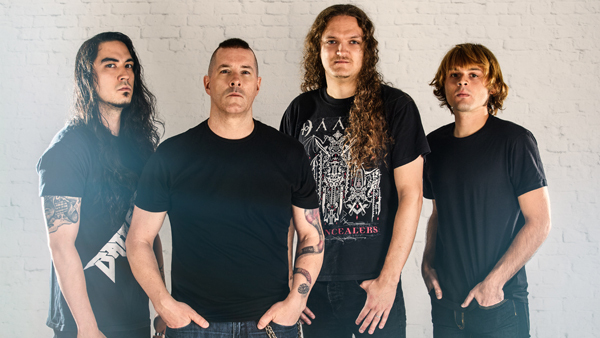 Which all leads to the fact that ANNIHILATOR’S 16th studio release, “For TheDemented”, is certainly their most complete and definitive statement yet. Waters didn’t venture back alone, while looking back through ANNIHILATOR’S history. “ I was well aware that trying to re-capture the past usually fails, or at least won’t come close. So I decided to bring in fresh ears, both musically and physically with Rich Hinks, my bassist for the last few years. And doing most all of the records by myself, including writing and playing most all on my own, as well as mixing, mastering, engineering, etc…, well it can become routine and can often hinder you from being objective and more creative. Rich came in and co-wrote the music with me, as well as co-produced the beginning stages of the record. His background of classic thrash metal meets an ewer “math” metal style was the perfect combination for me to simply ask, “What do you think of this?” He would most-oftenreply with “not the ANNIHILATOR style I like”, so we would keepgoing until we both felt that core ANNIHILATOR riffing and writing style presented itself. “ Bottom line, “ForThe Demented” captures some feel from ANNIHILATOR’s 1985-87 demos mixed with the first 4 ANNIHILATOR records. Back to the thrash meets melody but with some pure Waters guitar riffing, up-graded leadguitar shredding and vocals back to the demo-days meets the “Kingof The Kill” record.